From a tiranga rally in March to Kumbh volunteers, a monthly newsletter & more, Seva Dal will spread the Congress message across the country ahead of Lok Sabha polls. New Delhi: The importance of the organisational strength of the Rashtriya Swayamsevak Sangh (RSS) at the grassroots has finally dawned on the Congress. To counter the influence of RSS cadres on the Lok Sabha polls, the Congress is now looking to revive its dormant frontal organisation, the Seva Dal. The plan began with the deployment of 300 volunteers at the Kumbh mela to help devotees. And now, the Seva Dal is preparing to hold a ‘tiranga‘ bike rally across the country next month, to “expose” what its office-bearers say is the RSS and the BJP’s “fake nationalism”. However, countering the RSS on the ground is easier said than done — while the Right-wing organisation has millions of volunteers across the country, the Seva Dal, founded in 1923, just two years before the RSS, has only 1.7 lakh volunteers. But Seva Dal office-bearers are confident of making their impact felt. “The Seva Dal’s foundation of patriotism is based on secularism, tolerance and pluralism, unlike that of RSS and the BJP. Wo kaali topi waale real mein fake nationalists hain,” said Lalji Desai, Seva Dal chairperson. After a gap of 30 years, the Seva Dal is organising a mega convention on 13 and 14 February in Ajmer, Rajasthan, which will be addressed by Congress president Rahul Gandhi. It will also carry out door-to-door campaigning, for which it is training its volunteers. In Uttar Pradesh, for example, four different teams will take care of the campaign. The Seva Dal will also try and play a role in signing up new members at the booth level across the country. To give the volunteers a ‘modern’ look, the Seva Dal has already changed its dress code to jeans and T-shirts from the old shirts and trousers. The ‘colonial era practice’ of saluting has also been done away with. The Seva Dal has launched a magazine called Dal Jagat. The newsletter, as the organisation calls it, had not being published for the past 10 years. It is focused on the achievements of the Congress and the failures of the BJP government. In the February issue, there was a special message from Gandhi, which was distributed to around 5,000 workers. In the January edition, the focus was on farm distress and unemployment, issues that the party has been highlighting. 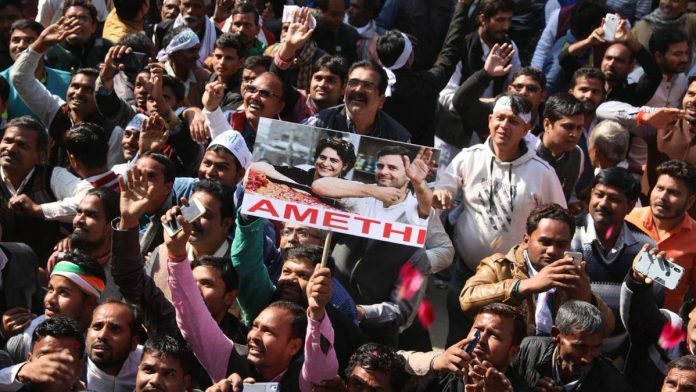 “The newsletter is circulated across the country and the idea is that the workers use the information while interacting with the public,” said a senior Congress functionary. The importance of social media too is not lost on the organisation. It has a main Seva Dal Twitter account, and 40 others for local units. It is also conducting seminars and talks on Gandhian philosophy and tolerance, which will be held in the mega convention in Ajmer too. The organisation has decided to accelerate its activities for public welfare and also be on the spot to help people at the time of natural calamities or disaster, just as RSS volunteers do. “The idea is to provide our service to the nation. Our squad is already ready and is pressed into action whenever such a need arises. We are giving a helping hand at the Kumbh and will continue to work in the future too,” said a Seva Dal functionary.